"Maues, c. 90-80 BC, drachm 2.44g, Standing figure of Zeus / Nike standing, facing right." "Scythian Kingdom in Pakistan, Maues, 90-57BC, AR Tetradrachm. Zeus standing facing left, holding sceptre. / Nike advances right, holding wreath." 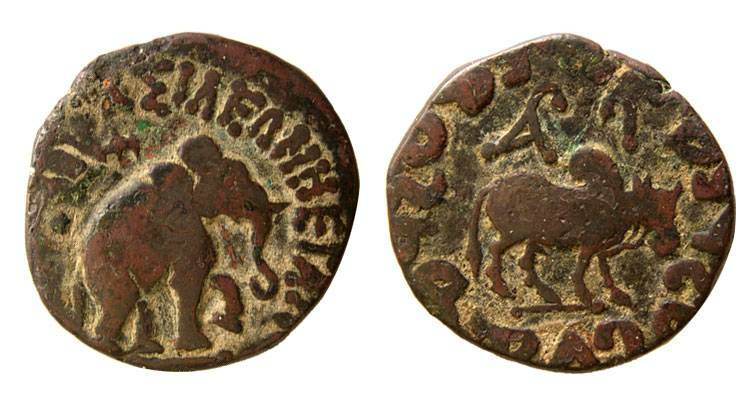 "Scythian Kingdom in Pakistan, Maues, 90-57BC, AE Dichalkon or Hemiobol. Elephant head facing right / Caduceus. Kohat mint." "Maues. Circa 95/85-65/60 BC. AR Drachm (2.45 gm, 12h). Mint in Hazara-Kashmir region. 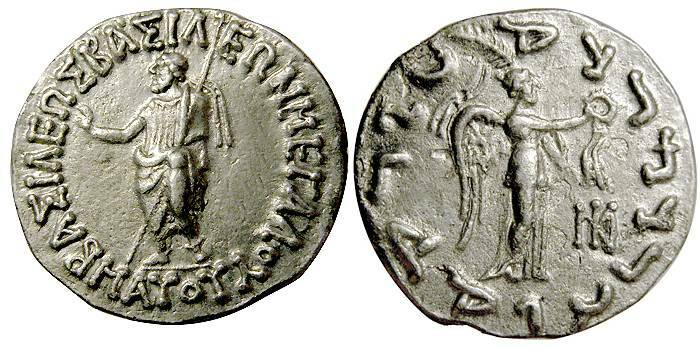 BASILEWS BASILEWN MEGALOU MAUO[U], Tyche enthroned facing slightly right, holding torque in her outstretched right hand, sceptre in his left / "Rajadorajasa Mahatasa Moasa" in Karosthi, Zeus standing left, holding Nike in his outstretched right hand, sceptre in his left; control mark to left." "AZES I. AR tetradrachm. 100 - 65 B.C. Obverse: King standing left holding sceptre. Reverse: Nike standing right holding wreath & palm." 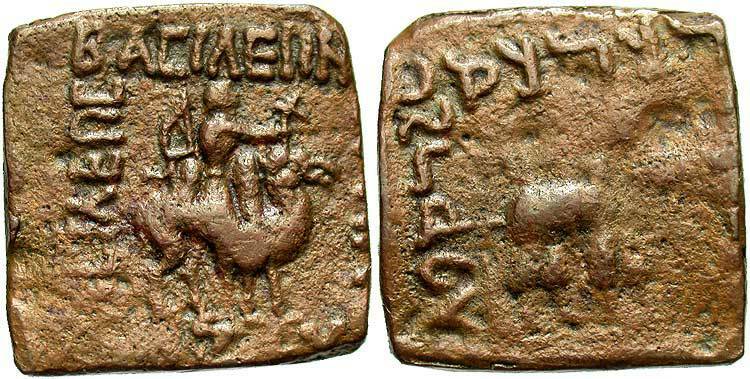 Azilises, who reigned as co-king with Azes I, gave himself, in Kharoshthi script, titles that included the Indic "Maharajasa Rajarajasa"
"Indo-Scythians, Azilises, c. 58-35 BC, Square AE23 Trichalkon. Herakles. Square AE22 Trichalkon. Date Struck c. 58-35 BC. Mint Taxila (?). Obverse BASILEWS BASILEWN MEGALOU AZILISOU. King on horseback right. Reverse Kharosthi legend: Maharajasa Rajarajasa Mahatasa Ayilishasa. Herakles seated left on rock with club and lion skin, monograms in field. Weight 7.13gm. Diameter 23x22mm." "Azilises 57-35 BC. Tetradrachm. Obv - King holding spear, mounted on horse walking right. Greek legend. Rev - City Goddess standing left holding palm and lamp. Control marks in field. Kharosthi legend." "Indo-Scythians, Azes, c. 58-19 BC, AR Tetradrachm. Pallas. Date Struck c. 58-19 BC. Undetermined mint in Gandhara, west of Taxila. Obverse BASILEWS BASILEWN MEGALOU AZOU. King on horseback right, holding whip; monogram before. Reverse: Kharosthi legend. Maharajasa Rajadirajasa Mahatasa Ayasa. Pallas standing right, holding shield and spear; monograms at left and right. 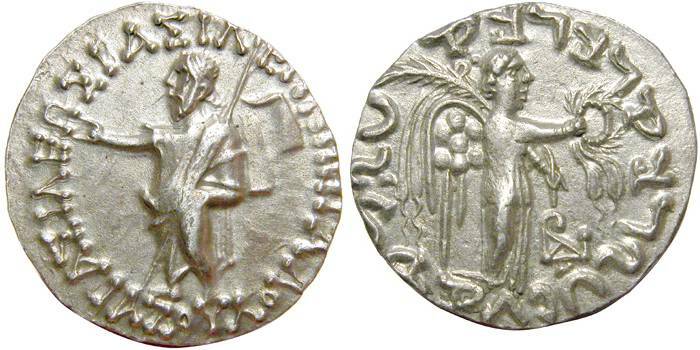 Although early references tend to attribute this series of coins to two rulers, Azes I and Azes II, it is now generally accepted that there was only one Azes, who was succeded in Gandhara by the Indo-Parthian Gondophares circa 19 BC." "Indo-Scythians Azes as Rajadirajasa. Circa 57-20 BC Æ Unit 14.69g. 26mm. Taxila mint? Humped bull Zebu standing right; monograms above. BASILEWS BASILEWN MEGALOU AZOU. Lion standing right; monograms above." "Indo-Scythian: Azes II / AE pentachalkon. (11.39 gm; 24 mm). Hazara mint. Early issue struck 35-30 BC. Elephant standing right / Bull standing right." 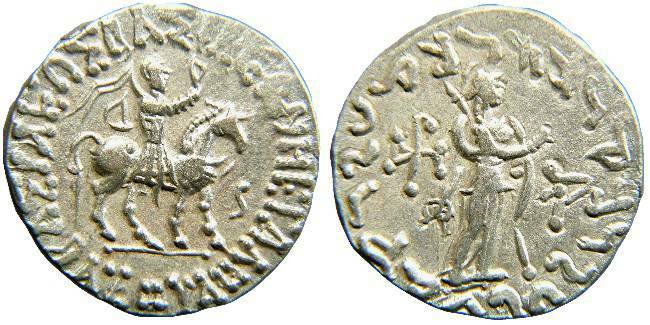 "Indo Scythian, Azes I: King on Camel / Humped bull. ca. 57-35 BC, AE, 25mm, hexachalkon. King on camel right / Humped bull right."